That year, about 8.6 million American households contained at least one person over 11 years whose identity had been stolen. The total cost was $13.3 billion, and the average for each household that lost more than one dollar was $2,200. The unauthorized use of existing credit cards accounted for 54 percent of all identity thefts. The study doesn't say so, but you may imagine that card-not-present online and mail-order transactions made up many of these. Only 10 percent of affected households saw their personal information used to open new accounts, but on average their loss was close to a whopping $13,200. By now, you're probably hoping things have gotten better since those data were fresh. But no. Using different sources and methodologies, statisticians at Javelin Strategy and Research figure that the number of identity-fraud victims had jumped to 12.6 million by 2012. Meanwhile, the the amount lost that year had also rocketed -- to $20.9 billion. However, if you have a social media account, you may be especially vulnerable to identity fraud. In particular, if thieves already have your credit card details, they could use your personal information on Facebook and similar sites to escalate their crime into a fully fledged identity hijacking. Shhhh! Don't post personal information, such as your date of birth, address and phone number on your Facebook or other social-media pages. TransUnion says just those three things are enough for criminals to commit some frauds. And, anyway, most of your good friends -- the ones you want to know that stuff -- already have it. Restrict access. If you haven't already, change your pages' security settings now. Choose "Private" as your status, and make sure that gives you control over who can become your friend, and who can see and post anything on your pages. Take care when you're out. If you share a computer at work, or use someone else's computer (including a hotel's or Internet café's) to access your social media accounts, take special care when logging in. By default, many sites tick the "remember me" box, and, if you don't uncheck it, any subsequent users will be able to log onto your pages with all your privileges. Password protection. Change your password regularly (once a month or quarter, according to TransUnion), and make it tough to guess. Use combinations of letters and numerals/characters that are based on things you can remember. Don't use your child's or pet's name both as a password and a favorite theme on your posts. Smart sharing. If a criminal's moral compass allows him to commit identity fraud, he's probably not above a bit of burglary. So don't let everyone know in advance when your house is going to be empty. Wait until you're back from vacations, business trips and events before telling the world all about them. Check your credit report frequently. Often, the first time people realize their identities have been stolen is when they're turned down for credit. If you regularly monitor your credit report, you can head off problems before they develop into something horrific. Tell your kids. Chances are, your kids use social media more than you do. Warn them of the dangers of sharing too much, and educate them about the ways to avoid becoming an identity-theft victim. Sickeningly, that last piece of advice is relevant for kids right now. Last year, the Identity Theft Assistance Center (ITAC) published the results of a survey [PDF] it commissioned into child identity fraud, and its conclusions were frightening. One in 40 U.S. households with kids under 18 contained one or more children whose personal information had been stolen by identity thieves. And, in a December 2012 press release, ITAC went on to warn that it's more difficult to detect this form of fraud when minors are the victims. So it's important that kids of all ages are aware of the dangers, and taught never to unnecessarily share their personal details. In particular, neither you nor they should ever disclose their social security number unless it's absolutely unavoidable. Of course, in spite of all those scary statistics, the chances are good that neither you nor your family are going to be directly affected by identity fraud. And it's worth bearing in mind one fact: By law, credit card companies are obliged to protect you from all but the most minor fraud losses on the plastic they issue, and most indemnify you against all such losses. Indeed, the statutory protections provided by credit cards are better than those for any other payment method. 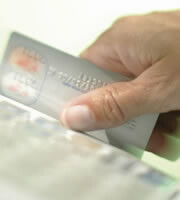 So using your credit cards could be one of the best ways of insulating yourself from the dangers of identity criminals. 0 Responses to "Identity theft: A Facebook poke -- in the eye"